With all of the drama and negativity on TV these days, it’s good to have something positive, powerful and life changing to watch. All I can say is, THANK GOD Oprah didn’t give up the TV business when she ended her show! Oprah’s Lifeclass on OWN has been awesome. There have only been two shows so far (it premiered on Monday, 10/10) but there has already been so much in depth teaching and examples of how to better understand ourselves as people, heal from our wounds, and ultimately live better lives. One reason I am such a huge Oprah fan is that we share the same passion. We are both passionate about learning, mastering and teaching principles that will lead people to live their best lives. I love the fact that she has such a huge platform to share these pearls of wisdom that constantly catapult people into healing and happiness. That is exactly what Oprah’s Lifeclass does, and if you haven’t watched yet, it’s definitely MUST SEE TV. She really zeros in on each profound lesson that was displayed on The Oprah Show and breaks things down so you can see examples of exactly how and why things and people work the way they do, and then gives practical advice so you can apply it to your own life, make the necessary changes and thrive. It’s really an awesome concept that I have been completely inspired by. Another reason I love the show so much is that Oprah is actually showing a deeper level of authenticity that I didn’t even think was possible for her. She has let down her walls even more than before by not only using her own past actions as an example of how NOT to be, but she also gives her personal thoughts on past guests, even when they aren’t favorable. This makes her incredibly relatable, in that as evolved as she may be, she is just like us on this journey to grow more and live better. Monday’s class was called, “The False Power of the Ego”. In it, she described how our ego and negative thoughts many times run the show in our lives. We in turn get caught up in ego and believe the thoughts in our heads, instead of tuning into our true selves which is much deeper and quieter than our loud forefront thoughts. She also discussed how the ego will attach its happiness and fulfillment to outside things and conditions which is how addictions are created and fed. For instance, when we feel we need certain clothes, relationships, food, approval, control, etc. to make us happy or satisfied is an act of ego. Enjoying those things and even loving them is perfectly fine. But when you NEED them as the only way you can find contentment and can’t do without them is when you are searching outside of yourself for what you already have inside. In addition to the show, she conducts a live webcast afterwards on Facebook and Oprah.com where she is joined by a teacher on each subject. Monday’s webcast had Eckhart Tolle showing us how to connect with the stillness within to learn how to hear from our true voice instead of being lead by our ego’s thoughts and cravings. She referenced and highly recommended two of his books, “A New Earth” and “Stillness Speaks” to learn how to recognize and manage the ego as well as get quiet and still enough to hear the truth of our beings. The question she asked everyone to answer was: Where does your ego get in your way? Tuesday’s class was called, “Letting Go of Anger”. She showed excellent examples of how anger not only keeps you stuck in your life, but it steals your joy and robs you of your blessings. She reiterated her favorite quote on forgiveness which is, “Forgiveness is giving up the hope that the past could be any different.” She explained how forgiveness is not accepting the wrong that was done to you as if it was ok, it’s accepting the fact that it happened and cannot be changed. The important thing is to let go and move on with your life. The live webcast after the show had Iyanla Vanzant teaching with Oprah about what anger really is and how to eliminate it. Iyanla taught how anger is really an act of fear, and right below the anger is hurt. It’s an old wound, probably from childhood, that has yet to be healed and has resurfaced in your life in a new way to remind you that it’s still there and needs to be cared for. They discussed the importance of getting past the anger and dealing with the hurt in order to free yourself from the paralyzing and debilitating effects of holding on to anger. The question for Tuesday’s class was: What’s holding you back right now? As you can see, these first two classes were deep and powerful and definitely life-changing when you take the time to be completely honest with yourself, be willing to see where you fit into the given situations, and take the actions steps to release the stuff that is getting in the way of the life you are meant to live. Wednesday’s class is called “You Become What You Believe”. It discusses having faith in yourself and how you manifest in your life what you believe about yourself, not necessarily what you want. If you have not already taken in these pearls of wisdom, I highly recommend tuning in. It airs on OWN at 8/7c. You can check out what it’s all about and catch up on the past lessons by clicking here. When you sign up with Oprah.com you will be able to connect with other people who are also learning from these lessons, as well as have access to what she calls life work (not homework) so you can apply these lessons to your own personal situations and get on the fast track to living your best life. In case you haven’t noticed, I’m loving it! Although these concepts are not new to me, I love having access to deeper breakdowns and different perspectives to help me master these principles in my own life. And I love that I get to take part in them in fun and entertaining ways, like watching TV and getting on the internet. 🙂 It’s definitely an excellent way to spend my spare time! Share your thoughts in the comments: Have you seen the show? What do you think of it? What “aha” moments have you had? How do these lessons help you further understand yourself and the people around you? 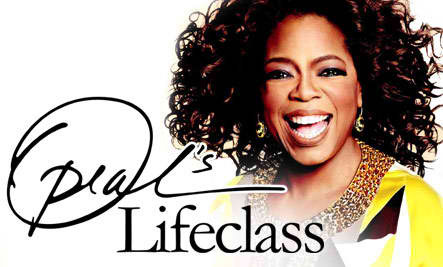 Thanks so much for letting us know about Oprah’s Lifeclass–I’m going to check it out! Glad to have found your blog through our LinkedIN group. I have to admit that I’ve only seen about 5 Oprah episodes in my entire life. She really caught my attention when she covered Eckhart Tolle’s A New Earth. I’ve thoroughly enjoyed her Master Series on OWN. There is some solid inspiration in those. I’ve recorded the Life Series and hope to watch it this weekend. Thanks for your take on it’s inspiration. I’m that much more eager to watch. I’m glad to have found you too Keyuri. I loved the Master Class series also. I found each story so inspirational. I’m also looking forward to her Visionaries series where they follow incredible visionaries and their success stories. I had not heard of the visionary series. Will look for those. Thanks! It’s always great to see that someone as influential as Oprah can deliver positive messages. As you mentioned, the concepts are not new, but often times we need to be reminded…thanks for the reminder! I totally agree Angela. I love it when highly influential people use their platform for good. I just checked in last night. I was a really good class. Looking forward to more! Me too! I loved all the shows this week and can’t wait for next week. I’ve always been a fan of Oprah (that’s OK even though I’m a guy, right?). Self-improvement, living your best life, always learning are lessons we all can benefit from. Thanks for letting me know what Oprah is currently involved in. But my query is about your blog. “My Two Cents” is the expression a young blogger about content uses and I thought he had coined the phrase for blog use. Do you take credit for that? Or is it just a useful phrase that many bloggers use to express their own opinion? Would love to know…since I don’t think I would use it continuously…but I’d like to be able to use it sometimes. Hi Myrna. “My Two Cents” is a commonly known phrase that has been used long before blogs were even created. So I doubt very seriously the blogger you’re mentioning can claim that phrase lol. You are definitely free to use it, as it was being used prior to even the internet. Very informative post. You gave your own thoughts on the show and your experience with it before doing a recap of each episode. Just based on this post, I subscribed to your blog. I look forward to reading your other work here. I haven’t always been a huge Oprah fan, but this show looks like it may be worth watching. I love the focus on teaching/learning. Based on your article, I’m checking it out! Thanks. Betty Lochner recently posted..Communication Quiz: Do you need some Training? Fantastic post – cant wait to see it all. And about letting go of anger – I tell you its the best thing I EVER did! I just wish others close to me would as they would be so much happier for it. It is hard to see those you love clinging to anger. At times, it’s hard to know what to do. Hey Janine! I totally know what you mean. You may want to share with your friends what you did to release anger to help them release theirs. Many times a relatable story from a friend can really break down a person’s walls and allow them to open up to what you have to say. I do know from experience that letting go of anger isn’t easy, especially if you’re not at fault. I’ve always admired Oprah and her inner will to help others. Just like her show, this life class is definitely a must watch. You’re right Lanre. The important things in life are never easy, but they are always worth the reward in the end. Thanks for sharing. Glad to have found your blog through our LinkedIn group! I DO love Oprah! She has really impacted my life as I have watched her from the beginning. I love what she says about being able to accept what happened without accepting that it was right. That is so powerful. She is my hero! !